The Global Risks 2015 report comes at a time when various manifestations of global risks brought into sharp relief that the world is not equipped to deal with these events or similar occurrences in the future. For the past decade, the Global Risks report has been calling attention to global risks and providing a base for multistakeholder action. Over this period, the evolution in understanding how global risks are thought about and assessed has been significant. This has led the Forum to update the methodology it has used to assess global risks for the 10th edition of the report, based on input from the members of the newly established Advisory Board. Building on this evolution, in this report a global risk is defined as an uncertain event or condition that, if it occurs, can cause significant negative impact for several countries or industries within the next 10 years. Based on this refined definition, 28 global risks were identified and grouped into the five customary categories: economic risks, environmental risks, geopolitical risks, societal risks and technological risks. A description of the risks and the methodology employed can be found in Appendix A and Appendix B. A further development in the 2015 report is the delineation of risks and trends. 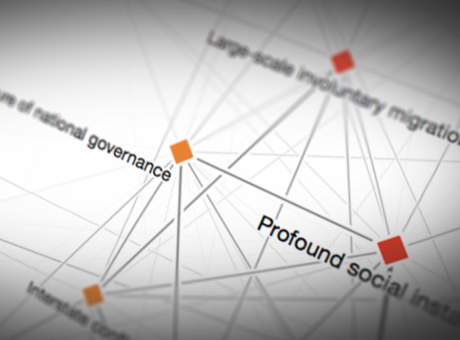 This distinction allows a better understanding of the underlying drivers of global risks. A trend is defined as a long-term pattern that is currently taking place and that could contribute to amplifying global risks and/or altering the relationship between them. The focus on trends can contribute to risk mitigation; for example, better planned urbanization can help alleviate certain risks that concentrate in urban areas. Moreover, the differentiation between trends and risks emphasizes the fact that trends, unlike risks, are occurring with certainty and can have both positive and negative consequences. Trends are long-term, ongoing processes that can alter the future evolution of risks or the interrelations among them, without necessarily becoming risks themselves. As in previous years, risks are assessed based on the perception of leaders and decision-makers obtained through the Global Risks Perception Survey. 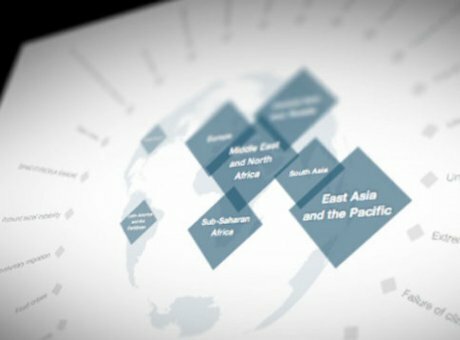 The survey captures the views of the World Economic Forum’s multistakeholder communities across different areas of expertise, geographies and age groups. It was conducted between July and September 2014 and gathered the perceptions of almost 900 leading decision-makers from business, academia and the public sector. A more detailed description of the sample and the survey’s methodology is presented in Appendix B. Complementary to the Global Risks Perception Survey data, the views of business executives were also collected on the risks of highest concern for doing business in their country, presented in more detail in Appendix C.
The results provide a snapshot of current perceptions on global risks and highlight priorities for action from three complementary angles: (1) the Global Risks Landscape, in which risks are assessed according to likelihood and impact, allowing a comparison of how perceptions have evolved over the years (Figure 1); (2) the Interconnections Maps of Risks (Figure 2) and of Risks and Trends (Figure 3); and (3) the level of concern in the short and long terms (Figure 1.1). 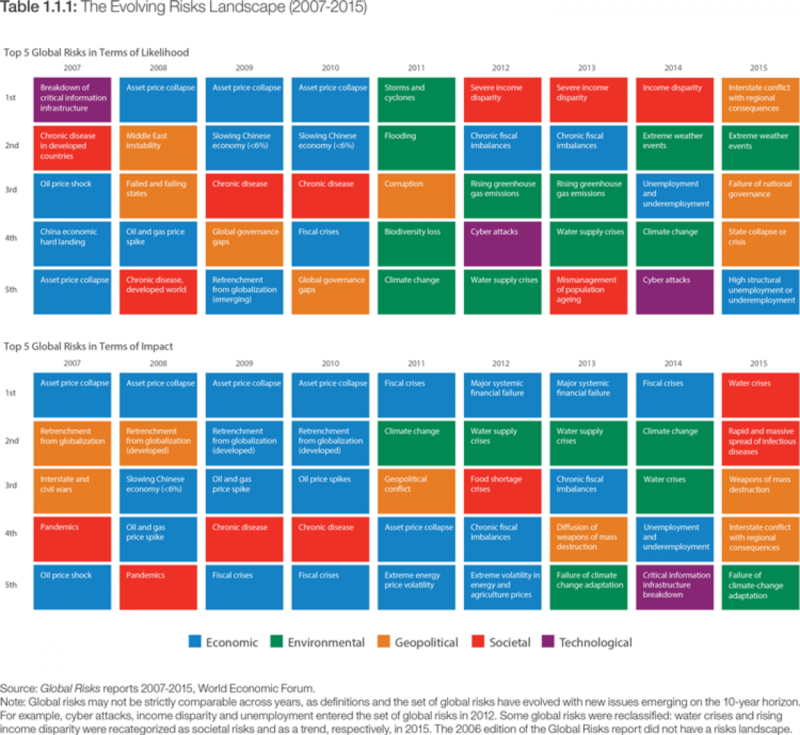 The Global Risks Landscape, as defined by the survey, highlights five global risks that stand out as both highly likely and highly potentially impactful (upper right quadrant of Figure 1). Interstate conflict has significantly leaped up both dimensions since 2014, arguably reflecting recent geopolitical conflicts that are fuelling geopolitical and social instability. As last year, concerns about environmental and economic risks remain, in particular around failure of climate-change adaptation, water crises1 and unemployment and underemployment reflecting concern about how little tangible action has been taken to address them. At the same time, cyber attacks remain among the most likely high-impact risks. Respondents also underscored the potentially devastating impact of the rapid and massive spread of infectious diseases, which reflects the need for a higher level of preparedness for major pandemics at both the country and international levels to address this important risk (see Box 2.4 in Part 2). In the geopolitical risks category, respondents identified weapons of mass destruction (WMDs), which include weapons containing nuclear, chemical, biological and radiological technologies, as the third most impactful risk, albeit as the second least likely risk. If deployed, they would create an international crisis with huge human and economic costs. In the coming decades, technological advancements, greater access to scientific knowledge and the increased vulnerability of classified information to cyber threats enhance the risk of WMDs proliferation, particularly in fragile areas. This highlights the need for greater international collaboration to control the proliferation of WMDs. 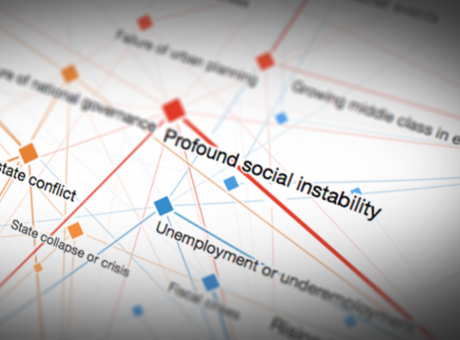 The prominence of risks dominating recent headlines in our assessments raises questions about the role of the “availability heuristic” – risks that have manifested themselves recently may be uppermost in people’s minds, even if their recent occurrence does not necessarily increase their impact or likelihood over a 10-year time horizon. 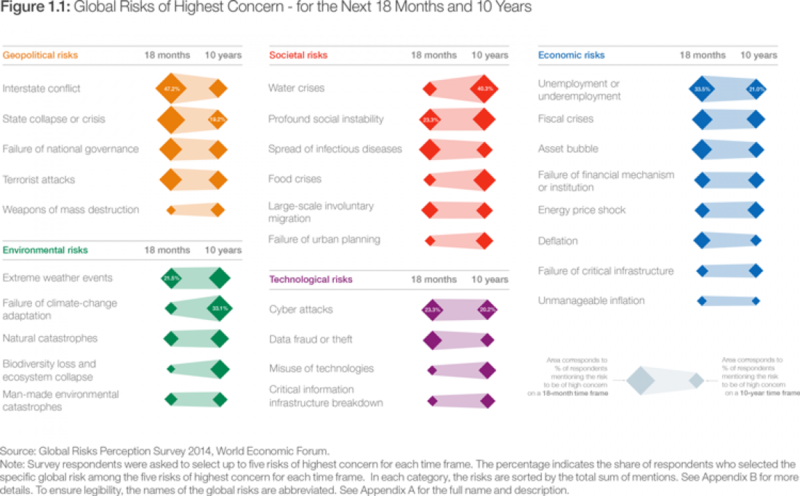 To reveal more about the psychology behind the responses, the survey this year asked respondents to nominate risks of highest concern over two time horizons: 10 years, as usual, and 18 months. The results are shown in Figure 1.1 above. In the short term, respondents are more concerned about global risks related to recent events and human action, including interstate conflict, state collapse, failure of national governance and large-scale terrorist attacks. The list for the longer term is dominated by risks related to physical and environmental trends that have been less prominent in recent headlines, such as water crises, failure of climate-change adaptation and food crises. Interestingly, the risk of social instability scores high in both the short and long term. 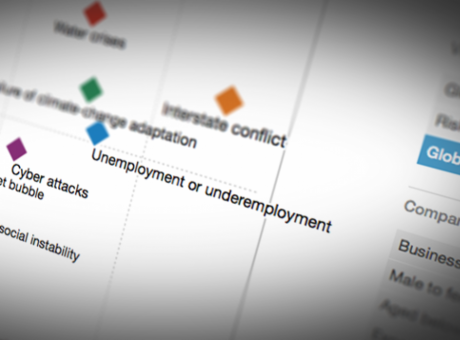 This trend towards social fragility is one of five threads that stand out from the 2015 survey – along with growing concern about geopolitics, the possible overshadowing of economic risks by other more imminent risks, concern about unaddressed environmental risks, and persisting vulnerabilities in cyberspace – which are explored in more depth below. 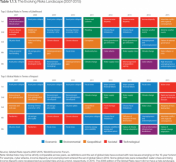 As the report’s 10th anniversary approaches, the evolution of the perceived top five global risks can be viewed in terms of impact and likelihood as documented in the Global Risks reports from 2007 to 2015. As Table 1.1.1 shows, economic risks largely dominated from 2007 to 2014, with the risk of an asset-price collapse heading the list in the run-up to the financial crisis, giving way to concerns about the more immediate but slow-burning consequences of constrained fiscal finances, a major systemic financial failure in the immediate post-crisis years, and income disparity. This year features a radical departure from the past decade; for the first time in the report’s history, economic risks feature only marginally in the top five. In the 25th year after the fall of the Berlin Wall, geopolitical risks are back on the agenda. The dispute over Crimea in March 2014 serves as a forceful reminder of the consequences of interstate conflicts with regional consequences that seemed long forgotten and unfathomable, as further explored in this report. Similarly, together with other events in 2014, such as the prominent rise of the Islamic State, it has brought state collapse and the failure of national governance back into public consciousness. At the same time, health-related risks, such as pandemics – last considered impactful in 2008 – have made it back into the unglamorous top, following the unprecedented spread of Ebola. On a higher level, Table 1.1.1 also indicates a shift over past years away from economic risks in general to environmental risks – ranging from climate change to water crises. While this highlights a recognition of the importance of these slow-burning issues, strikingly little progress has been made to address them in light of their far-reaching and detrimental consequences for this and future generations. 1 The risk of water crises is classified as a societal risk for the purpose of this report. However, it has an important environmental dimension.